Well, that game had a different outcome than what I was expecting, in a number of ways. First off, I predicted a Toronto victory though I can’t say I was shocked that Georgia won. Secondly, the last three times these two teams met saw OT so I was expecting a closer game, which it was until Toronto stopped scoring. And third, given the first two minutes of the game, I didn’t expect it to be a defensive battle. Two minutes into the first quarter, it was 2-1 Rock with the shot count sitting at 2-1 Rock. My dad came with me to this game and we joked that the game might end up 27-26. It settled down after that, and we only saw two more goals the rest of the quarter. A few minutes into the second, Toronto scored a couple more within a minute and while I wouldn’t say the Rock were in control, all facets of the team were doing well. Unfortunately for them, all facets of the Swarm game were also doing well. Then Georgia began to score and Toronto stopped. It would be over 32 minutes before the Rock scored again and by that time, the Swarm had scored six straight. The Rock scored two in the first two minutes, and then five in the next fifty eight. The three goal deficit was certainly not insurmountable given that there was almost nine minutes left, but Mike Poulin was on his game and there was no way he was going to let the Rock back into it. Poulin was excellent, particularly in the second half, stopping almost everything that got to him. However a lot of shots never got to him, either because they were blocked or because they were never taken in the first place, and that was because of the D in front of him. I don’t know how many times a Rock forward, mostly Adam Jones, reared back to fire a bullet at the net only to pull up at the last second and pass instead because he couldn’t see the net at all. There were one or two goals on Rose that you might have expected him to stop, but for the most part, he was very good. He made a few sliding stops to prevent quickstick goals, something he’s getting very good at, and threw his arms up at least once to prevent a goal from behind the net. Toronto’s defense was very good as well; perhaps less effective than Georgia at actually blocking shots, but there were a lot of ball-dislodging stick checks and quick transition. However, the transition seemed to lead to a lot of ill-advised shots, perhaps from defenders trying to spark the struggling offense. No Rock transition players scored at all so the only effect it had was a lot of five-second possessions. For the second straight night, I lost count of how many times the Swarm forwards hit posts or the crossbar. If the net was an inch wider or higher, this would have been a much higher scoring game – probably on both sides, since the Rock hit a few as well. What that means of course is that there were a bunch of shots that Nick Rose will get credit for saving even though they actually beat him. But I think the bigger problem for the Swarm is that they were putting those shots in last year and just missing them this year. The biggest missed opportunity for the Rock was the power play. They had six power plays, scoring on none of them. In the third, they had a 5-on-4 for 45 seconds, then 5-on-3 for a minute and a half, and then 5-4 again for about three and a half minutes. They had a bunch of shots but the Poulin Wall held. I’m a big fan of Brock Sorensen and I think he’s had a good season but he had a frustrating night. First, he had an early breakaway but while running (lumbering?) up the floor, it really looked like it took every ounce of strength he had just to continue running, and he wasn’t running that fast. It looked like he was in pain but he kept going. Then he took two penalties at the same time early in the fourth – as Pat Gregoire said on the broadcast, the holding one was fine, preventing a scoring chance, but the illegal crosscheck was unnecessary. Once he got into the penalty box, he smacked his stick against the glass in anger, which could have been another penalty (unsportsmanlike conduct – there’s a rule that specifically addresses hitting the glass with your stick in the penalty box) but the ref either didn’t see it or chose to ignore it. Then right at the end of the fourth, Bryan Cole and Phil Caputo each took roughing penalties and while those were being announced, Ethan O’Connor was heading from the Swarm bench out onto the floor and out of nowhere, Sorensen cross-checked him to the ground. There was no obvious reason for the hit, and O’Connor stayed down on the ground for a while until he ran the ten feet to the bench and heaved his pregame meal over the boards. That’s not a good sign. The game was mostly over by that point so Sorensen’s five minute penalty didn’t matter but I wouldn’t be surprised if the league reviews that one. Sorensen may have to sit another game and think about what he did. I saw a fan wearing a Bandits jersey – a bit weird at a Rock/Swarm game. But then I saw that it said “Orleman” on the back. Must have been a fan or family member of the Swarm’s backup goalie. Jordan Hall was given a game misconduct for a nasty crosscheck illegal bodycheck to the head of Damon Edwards. If that seemed out of character, it was: it was the first game misconduct in Hall’s career. He hadn’t even had a major penalty since 2012. Update: I watched the replay and I got the penalty wrong – it was an illegal bodycheck, not crosscheck. The word “nasty” is probably not accurate either. Hall led with his shoulder, which is totally legal, but hit Edwards in the face which may be why he got the penalty. I don’t think it was worth a game misconduct though. Did anyone notice that when the ball was lodged in Poulin’s equipment during the fourth quarter, the clock continued to run? A good 30 seconds was lost because of that. I didn’t see it but my friend Steve noticed. Oddly though, I was unable to find it on the replay. Perhaps it was in the third quarter. At one point in the second quarter, Lyle Thompson must have played about five consecutive shifts. Played offense, then got caught on defense, then back to offense, another quick transition meant another defensive shift, then another on offense before he finally made it to the bench. Luckily for the Swarm he’s a very good defensive player, but I’m sure he was gassed after that. 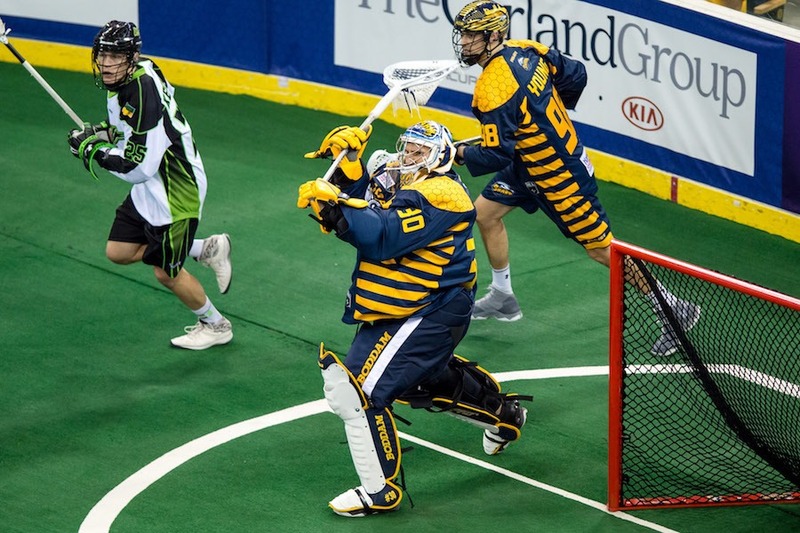 This entry was posted in Game Review, Georgia Swarm, Toronto Rock. Bookmark the permalink. The ball getting stuck was at 2:36:44 of the web feed. The ball is whistled in a 1:38 remaining. It gets free at 1:23. It is then blown back in. That is 15 seconds of game time lost. It was right in front of me, and it drove me nuts. Rose was screaming at the ref and pointing to the scoreboard about it too.